The presents given by Thailand’s King Rama V to Russia’s last Tsar are displayed at St. Petersburg’s Kunstkamera, Russia’s oldest museum. Some of the gifts are now in need of major restoration. While undertaking his Great Eastern Journey, the man who would become Russia’s last Tsar established links with rulers in many parts of the world, including Siam, where he met the then-ruling monarch, King Rama V. The fifth ruler of the Chakri Dynasty presented the then-Crown Prince Nicholas (the future emperor Nicholas II) with a few gifts. The Peter the Great Museum of Anthropology and Ethnography of the Russian Academy of Sciences, which is the complete name for Kunstkamera, houses these gifts: A Lao-style sabre, a Siamese-style sabre, a Malay kris with a blade of meteoric iron and official portraits of King Chulalongkorn (Rama V) and Queen Savang Vattana. The prince’s Great Eastern journey took place in 1890-91 and included Italy, Greece, Egypt, India, Ceylon, Singapore, Java, Siam, Vietnam and Japan. From Japan the prince travelled to Vladivostok, where he participated in work building the Trans-Siberian Railway and then traveled through Siberia and all through Russia to return to St. Petersburg. Sergei Trifonov, a senior lecturer at the Department for the Far East at St. Petersburg State University, wrote in his book ‘King Chulalongkorn in Russia,’ Nicholas spent five days in Siam from March 19 to 24, 1891. He was accompanied by Prince George of Greece and his retinue, as well as Prince Esper Ukhtomsky, who was a tutor to Nicholas and later wrote a book about these travels. “The guests arrived at the mouth of Chao Phraya River on the cruiser Azov. Here the prince was greeted by the Minister of Foreign Affairs for Siam Prince Devavongse and the Minister of the Court Prince Silpakom. The guests were accommodated on the Royal Yacht Apollo and traveled up river to the walls of the royal palace,” wrote Trifonov. In the following days, Nicholas was shown the capital of Siam, the Grand Royal Palace, the Palace of the Second King, the Royal Country Residence, and was also awarded the highest order of Siam, the Most Illustrious Order of the Royal House of Chakri. Nicholas was also shown the treasury of the Grand Palace, where he was probably presented with the gifts. In Esper Ukhtomsky’s book, there is a list of items. Apart from those already named, Chulalongkorn gave Nicholas a huge pair of ivory tusks, candelabras in the form of birds on a pedestal, a vase supported by three birds, a dinner service on a gold tray, and also two baby elephants, a young panther, two white monkeys, numerous spotted birds and much more. Ukhtomsky wrote in his diary as they departed Siam: “You depart from Siam, as from a dear old friend”. The treasures were carefully brought to Russia, and in 1894 were included in a large exhibition of gifts made to Nicholas during his eastern tour. The exhibition took place at Tsarskoe Selo, and afterwards the gifts were sorted. 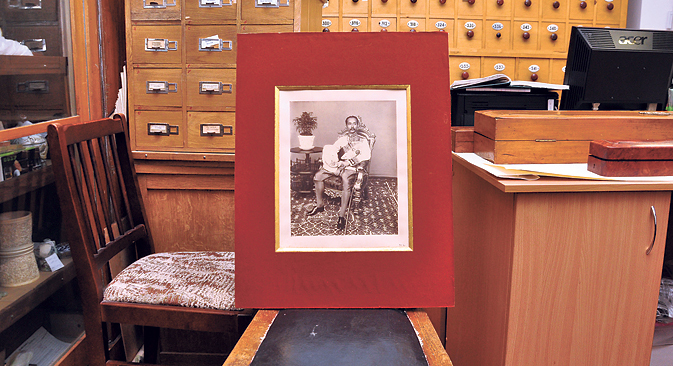 So the Lao-style sabre, Siamese-style sabre, Malay kris with a blade of meteoric iron and the portraits were taken to Kunstkamera for storage and the remaining gifts from King Rama V were sent to the Hermitage. The gifts survived the October Revolution, the fall of the Soviet Union and Russia’s economic decline in the early 1990s, but despite the careful storage (the museum’s curators are extremely delicate in their work) time has not entirely spared the presents. The sabre’s case has cracks, the blades have darkened and the sheath of the Siamese- style sabre has cracked. So the artifacts require restoration, which can only be entrusted to a highly skilled specialist, able to return these valuables to their original appearance. “To carry out this restoration, we need highly skilled specialists and significant resources,” doctor of historical sciences, Elena Ivanova, 80, told RBTH. Ivanova is responsible for the Thailand collections at Kunstkamera. She has studied Thailand’s ethnography for over 50 years. Despite visiting Thailand only once, she has written an entire series of works on Siam’s history and ethnography. There has already been one successful attempt at restoring antiquities in Thailand. For St. Petersburg’s 300th birthday celebrations, the statue of Buddha Maitreya, held at the St. Petersburg Buddhist Temple, was restored in Thailand. The statue was given to the temple by King Rama VI Vajiravudh, for its opening shortly before the October Revolution. Last year, Kunstkamera celebrated its 300th anniversary. The museum was founded by Peter the Great in 1714 and became Russia’s first museum. The museum houses a unique collection of historical artifacts from former times, revealing the history and traditions of many cultures. The museum has departments studying the life and people from all over the world: North and South America, Asia, Africa, Australia and the Pacific. However, the most famous section of the museum is its collection of anatomical rarities and anomalies. The core of the collection was established by Peter the Great, who wanted everything strange and inexplicable to be brought to the museum. He also spent significant sums on purchasing collections in Europe. The Kunstkamera building was completed after his death, and since the beginning of the 18th century has been the symbol of the Russian Academy of Sciences.